Make a Donation: Your donation to our school will be used to fund our academic program and directly support the 166 scholars we serve. Arizona Public School Tax Credit: The Arizona Public School Tax Credit Program allows married couples to donate up to $400 and single taxpayers to donate up to $200 each year and receive a dollar for dollar TAX CREDIT. Your donation will be used to sponsor CASA Academy’s character development and field trip programs. Learn more at the Arizona Department of Revenue’s website. This donation is an Arizona Public School Tax Credit. PLEASE NOTE THAT YOU HAVE NOT YET DONATED TO CASA. YOU MUST CLICK ON "MAKE A DONATION" BELOW AND MAKE YOUR DONATION AT PAYPAL.COM IN ORDER TO DONATE TO CASA. Did you know you can support CASA every time you shop? Shop through Amazon Smile and Amazon Smile will make a donation to CASA Academy. 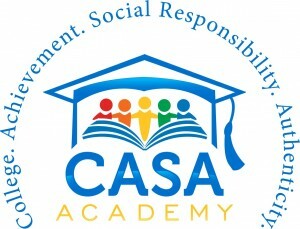 Follow the link below and select “CASA Academy” as your organization of choice. Thank you for supporting CASA scholars every time you shop! CASA Academy is an Arizona nonprofit corporation that has 501(c)(3) status. Your contribution is tax-deductible to the extent allowable by law.